Mega Music, Mega the Learning? The music lessons are getting more difficult to grasp even as I accompany J for the lessons. We BOTH have difficulty learning the notes. I was pretty frustrated and searched online for some help. I did one post on how I used a tangible method to help J learn here. But now I am getting really confused with the positions of the notes especially when it repeats itself and we have to remember the positions of each note! I decided to do something about it for the sake of both Me and J.
I searched online and found a comprehensible music theory sheet. 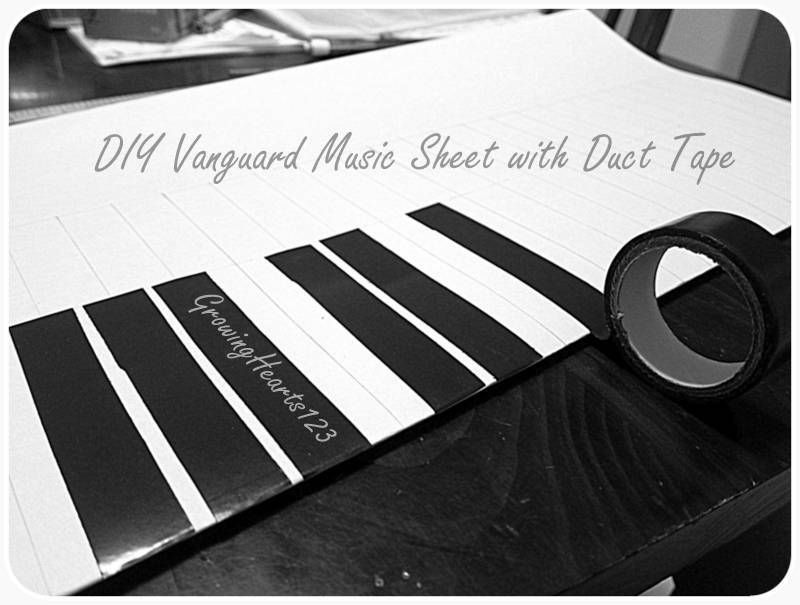 As it was too Ink consuming, I decided to DIY my own sheet using a white Vanguard sheet. As I am highly visual, and hands on, I figured this blown up size will be a good prop to use as a visual aid. I copied exactly what I found online. 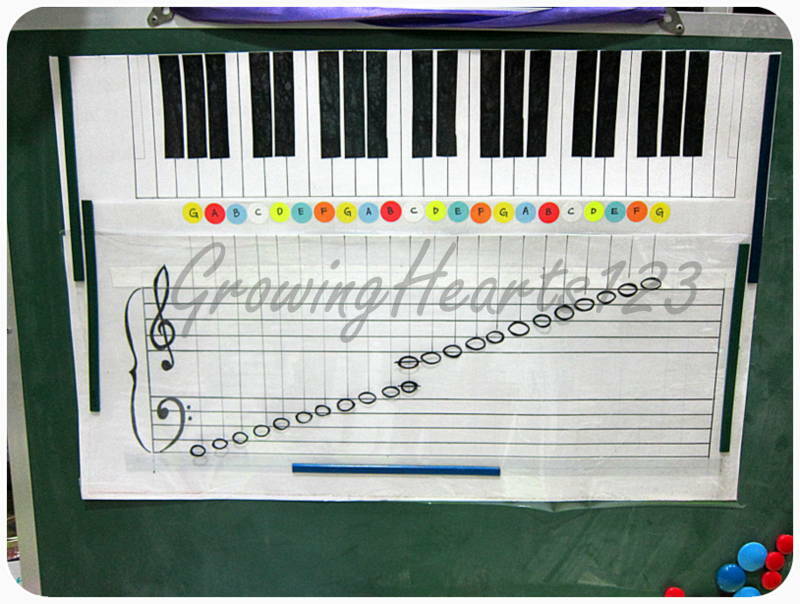 (tried to get the link to no avail) Then I used black duct tape to do the black piano keys. I am not going to ‘teach’ you any music here. 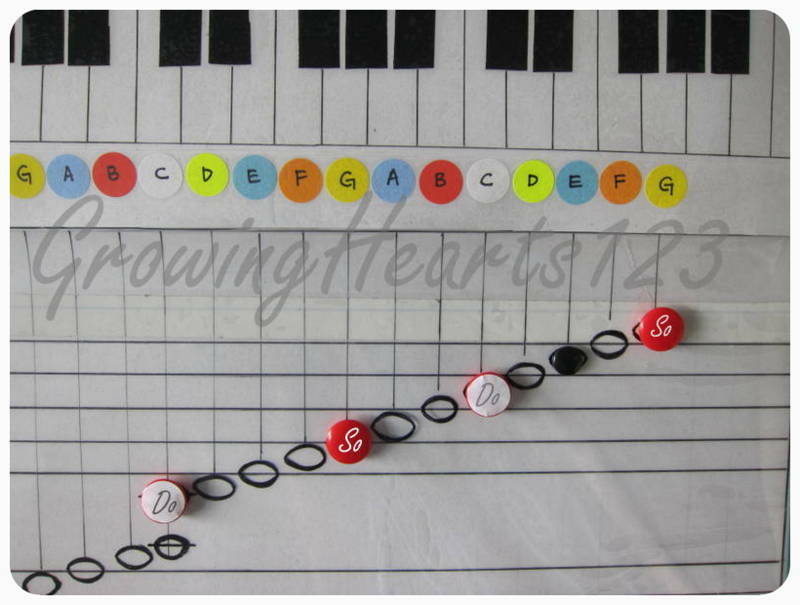 This is a post on how my DIY Music Sheet has helped support mother and son in learning our notes more effectively. Here’s the full drawing. I had also added a layer of transparent plastic wrap before I drew the notes so that I can have a blank template when I need to use it. I also separated the top piano keys from the bottom so that when J is familiar with the keys in relation to the notes, I can ‘test’ him without the reliance of the piano keys. The alphabets have been labelled in colours to help him differentiate the notes. At the same time, he will also notice the notes that repeats itself (since they are of the same colour). For example, G is in yellow, A is in blue and so on. The set then repeats itself in the same order of colour codes. I taught him using magnets and we memorised the So and Do positions so that we can work out the rest of the positions accordingly. For example, below, the black magnet can be recognised either by Do,where one works upwards like a staircase, as in Do-Re-Me Or one can walk ‘down the stairs’ So-Fa-Me) However, we must be already familiar with our Do-Re-Me-Fa-So-La-Ti-Do and the reverse Do- Ti-La-So-Fa-Me-Re-Do in order to go ‘up’ and ‘down’ the stairs (as my friend helped me to visualise). I hope this hands on method would help your child too! Please pardon me for being so bold as to post on music when I do not know much! 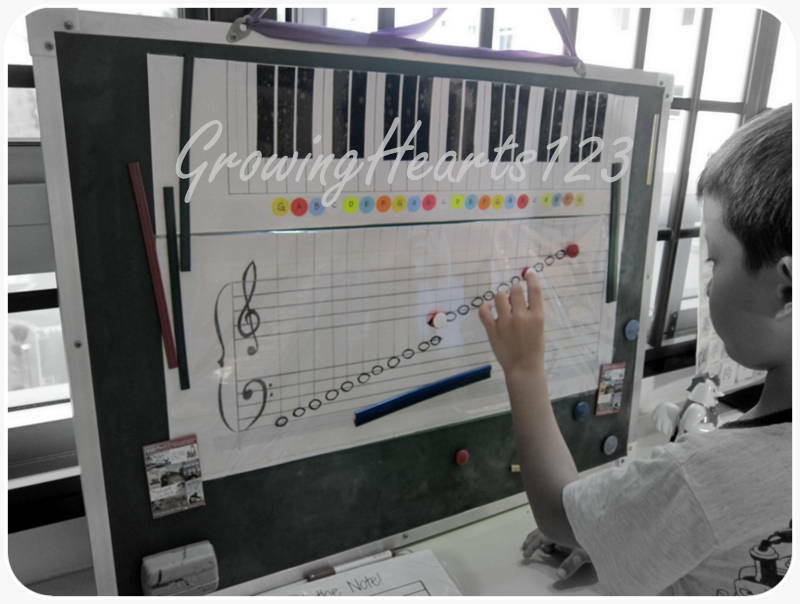 I do this so to share how having a mega visual aid helped us in this learning together. At the same time, as a shout out to gather some help and support from you readers as well. If anyone has good learning materials that I can benefit from, please share with us? So far, I only found 2 websites that are useful. Let’s Play Kids Music and Ear training and Improv. Would appreciate LOADS if anyone can share more on useful theory resources! Please e-mail me or leave a comment. Thanks in advance! Wow! You are a very conscientious mother. Great resource you have created. 🙂 Not sure if this will value-add, but in school, children are taught that the notes on the spaces spell “F-A-C-E” and the notes on the lines spell “EGBDF” (remembered more easily by Every Good Boy Deserves Food). Jiayou! Hi thanks for dropping by and giving me some useful tips Pea! Will press on! : ) Appreciate it lots. So kind of You to do these! Have pinned under favourite in my comp to show my boys! 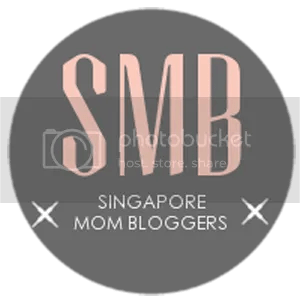 So exciting to learn via your blog!